As I’d feared in my previous post, I did indeed get stuck on my dirt road on my way back to my property that day. Actually, I got stuck 3 times, and instead of getting the hint after the first time, or the second time, I barged on, undeterred, like a fool. In my defense, things didn’t get too bad until the 3rd time I got stuck. The first time, I reversed a few feet and gave myself some extra momentum to overcome a slick patch. The second time, I remembered to engage the differential lock, and muscled my way up an icy incline. The 3rd time, though, I got stuck on a particularly rough section of the road, where there’s a tight corner, steep grade, and some big boulders. I kept backing up, but not regaining any ground, until I was up against a bush. Eventually, I walked up to my camp, grabbed a shovel, and started shoveling compacted icy snow out from ahead of the tires. Fortunately, that did the trick. (By the way, if you were following my new Twitter account,@laptopandarifle, you would’ve gotten a real-time blow-by-blow of that incident…). I may be living a dream, but not every day is exactly rosy. I hit a rough patch today, when, for a while, it seemed like nothing was going right. I was already feeling frustrated with the slow progress, when I slipped and drove my cordless drill into my finger. It’s just a flesh wound, but combined with the crack on my thumb, I felt like I was slowly losing use of my hands, one finger at a time. Then, I screwed up installing a window. My feet are still constantly cold. I realized that I couldn’t put the chimney where I thought I could after all. I noticed that the door wasn’t hung square, and it was too late to fix. I worried about whether I’d be able to get my car back down the dirt road, and if I could, whether I’d be able to come back up. If I had to leave my car farther down the road, I may have to walk a quarter mile in the cold to go to bed. I suddenly wasn’t sure I’d finish Hut 2.1 before conditions forced me off my property. Dark clouds rolled in. A chilly gust blew through the open walls of my cabin, numbing my fingers as I tried to mark my next cut. I wondered to myself why I couldn’t just be like everybody else, and be content working in a warm office, going home to a wife and kids. 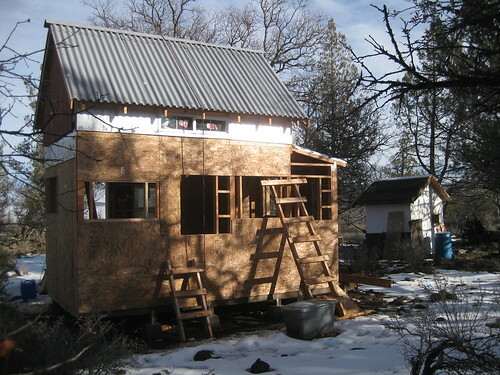 I thought about how crazy it is that I’m building my own house, alone, in the middle of nowhere, in the cold, without any training in carpentry, construction, or architecture, on a shoe-string budget, in defiance of god knows how many building codes. I felt like I was doing everything wrong. Imperfections glared back at me. Unfinished tasks loomed in my mind, overwhelmingly. Doubts flashed through my mind — maybe I should let other people do the building, and just pay a mortgage, like everybody else. But, eventually, I pulled myself together, and had a productive day. Out here, alone, I am the source of all my problems, but I am also the solution to all my problems. At least, I have to be, if I don’t want to get stuck. In the city, things that stress people out are the things they can’t control. Whether it’s their job, the cable company, the plumber or mechanic, or their noisy neighbors, peoples’ lives are so deeply intertwined with –and dependent on– others that they often have little control over the problems they face. Out here, nobody causes any of my problems, but I also can’t expect anyone else to solve my problems for me either. Sometimes it feels overwhelming, but at the end of the day, I overcome those challenges and feel better for it. Indeed, I found solutions to my problems. I bandaged my fingers, and got back to work. I found a new place to put the chimney. I tore out the window and installed it satisfactorily. I ignored the pain in my toes — actual risks of frostbite are negligible. I devised a workaround for the door problem. I warmed up my fingers with a hot mug of coffee, picked up my saw, and kept cutting. After dark, I walked down the dirt road, shovel in hand, breaking up the ice along the way so that I could get out the next morning. And I got my bedding out of the car, heaved it up the makeshift ladder, into the loft of Hut 2.1. Last night, I slept in my new unfinished cabin for the first time. It was a bit draftier than the car, but if I want to get warmer, I’ll just have to finish the damn walls. This entry was posted in Hut Hut Hut, Land! and tagged journal. Bookmark the permalink. As a person who has built her own house without prior knowledge of things like electrical wiring, it’s much more satisfying knowing that YOU did it. Though it’s nice when other people build for you things tend to be finished sooner….. Vapour barrier and insulation is a ceiling isn’t it??? It’s only been 5 years…..
Keep on keeping on. I love Hut 2.1’s design. That’s thought-provoking and envy-inspiring. I’m willing to bet most of your readers are envious of your independence, reading from the relative warmth of our offices. Keep it up for our sake! Well it sounds like you are learning your carpentry as you go. I can’t tell you how many times my husband has drilled his fingers. Going through a thumbnail is the worst so try not to do that one. Some people suggest carrying cat litter in your car’s trunk in case you need something for traction. It looks like you are getting the hut closed in. Hang in there! got tire chains? if not I might have a spare set. Would need to know your tire sizes tho. Bear in mind anyone without homesteading experience (a helluva lot of sheople) could certainly do worse. I wish I could come down to assist/encourage you but now is not the time. Have you tried this old New England trick for wet feet? Bread bags (or any thin non ziplock bags). Put them over your socks and inside your boots. Works great for keeping the outside damp on the outside even if it keeps the sweat in. Can do wonders for a less than waterproof pair of boots. Saved me from frostbite more than once. What size boots do you need? Someone might have a pair that would fit you. Also instead of accepting donations through sales of calendars you should just accept donation of things you need. For example post a list of things you are going to buy and include the make, model, size etc. You never know, people that read your blog might be willing to donate if they see and hear how it helps you in future blog posts. I think a small donation is fair considering the entertainment I get from reading your blog. I still wondering why your not sleeping in hut #1…four walls and a bunk…no wind. just having a body in there cooking etc would warm the place up a lot….or am I missing something? The sleeping pad in Hut 1.0 is only 2ft wide, and is too narrow for my bedding. I sleep much better if I’m on my futon and under my nice thick comforters (which take up more space) even if it’s slightly colder. Hang in there! Homesteading is not easy at all, if it was your woods would be full of many more neighbors than you have now. Consider what you are experiencing now as the learning stage. Ten years from now you will look back and you will have the benefit of all these experiences to draw strength from when you are still working on your land, constucting whatever new porject you have decided to tackle. You will know from experience what does work and what does not work. The one thing you need to take care of though is your personal health, which includes your feet. As soon as possible invest in some proper winter foot wear. Here in northern wisconsin we work and play outside all day, even in the -10 to -30 weather which we do experience throughout winter on a regular basis. We dont stop when building or in my case while working on heavy machinery. Invest in a good pair of LaCrosse Iceman or even better there Ice King boots. They are a little spendy to begin with, but they will hold up to any construction work you can put them to and will keep you warm and last a good decade at the very least if taken care of properly. Also, invest in some good wool socks, but dont just wear the wool socks alone. Get a pair of thin liner socks, these will wick moisture away from your skin and pass it to the wool sock. This has the purpose of keeping your feet dryer and so therefore warmer. Another thing to consider is investing in some Carthartt style work bibs that pull up over your pants. These make working outside in cold weather very bearable. If you have a good hooded sweatshirt on and your starting to sweat a little from working you can pull off your coat and with the bibs on and the sweatshirt you will be very comfortable. As they say, dress in layers! 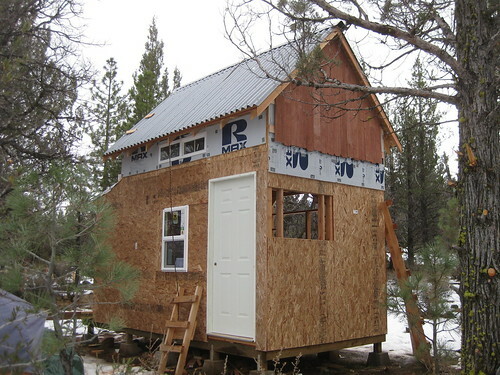 Overall, If your warm and your feet are dry you will be way more productive and remember, frostbite and the loss of a toe from it will not do you any good with finishing up your hut. I got a pair of almost new Sorrel Caribou boots you can have. Size 9. You can stand in the snow all day with these.